This is a 36" shield with white bulbs .It has four layers of wood and perfect for any chapter needing a shield! It also has gold trim, which is slightly different from others. This is a 36" shield with white bulbs .It has four layers of wood and perfect for any chapter needing a shield! This shield is hand-crafted and 3D shield that can be left plain of stained any color to make a custom shield! This is the classic version of the current shield that is being used by the Fraternity. This is the Purple on Purple Cuff-link version of the current shield that is being used by the Fraternity. This is the Purple on Gold Cuff-link version of the current shield that is being used by the Fraternity. 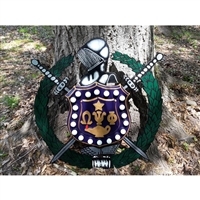 This is the Golden Oak Stained version of the current shield that is being used by the Fraternity. 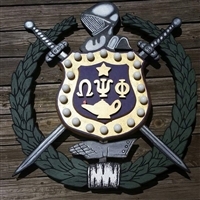 This is the classic version of the current shield that is being used by the Fraternity.